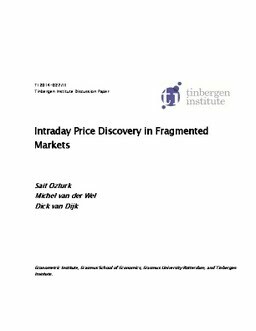 We explore intraday variation in the contribution to price discovery across different exchanges. We estimate a structural model with time-varying parameters in state space form using maximum likelihood. We analyze data for 50 S&P 500 stocks in 2013 and find that the constancy of shares in price discovery is rejected. Tighter quoted spreads attract informed trading from other exchanges. Exchange listing and industrial sector of a stock significantly affect the dominant venues of price discovery in different parts of the day and following macroeconomic news announcements.